North Carolina Law (NC General Statute Article 2, Section 130A-34) requires Boards of Health to consist of eleven members; eight designated professionals and three members of the general public. 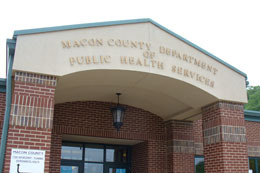 The Board of Health is appointed by the Macon County Commissioners. The documents below are presented in Adobe Acrobat PDF format. These files may be viewed on-line or downloaded (saved) to your local computer. The links below are presented in Adobe PDF format and may be downloaded (saved) to your local computer.